With the continual increase in demand for global energy, scientists across the world are working to find a way to transition from fossil fuels to renewable energy sources that are more efficient and environmentally friendly. The sun delivers more energy to the Earth’s surface in one hour than the entire world uses in one year, and realizing the full potential of solar power will require finding effective, inexpensive ways to utilize this vast energy source. 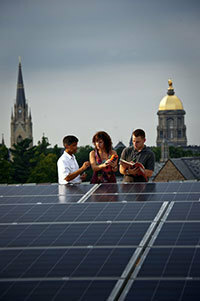 Researchers at the University of Notre Dame have identified a possible inorganic material for perovskite solar cells, which provides a lower-cost alternative to the organic polymers currently used in the cells. The study was published in the Journal of the American Chemical Society by Jeffrey Christians, a graduate student in Notre Dame’s Department of Chemical and Biomolecular Engineering; Prashant Kamat, The Rev. John A. Zahm Professor of Science; and Raymond Fung, an undergraduate student at the University of Waterloo. Organo-lead halide perovskite solar cells have recently emerged as one of the most promising candidates for the next generation of solar cells, with record efficiencies increasing from just a few percent to more than 15 percent in just a few years. However, these solar cells have exclusively used organic hole conducting polymers, which are one of the components responsible for conducting electricity in the cells. These organic polymers are generally expensive because they are synthetically produced and must be pure for photovoltaic applications. For this study, the researchers replaced the organic polymer with copper iodide, a inorganic compound that is less expensive than organic polymers. Their results showed that copper iodide could produce power conversion efficiencies as high as 6 percent, with excellent photocurrent stability. Although a 6 percent efficiency is lower than the nearly 8 percent efficiency achieved in comparable cells utilizing organic polymers, with refinements to the solar cell, copper iodide still provides a promising hole conductor for perovskite solar cells. The researchers have already identified several promising areas to optimize the perovskite and hole conducting layers to further improve the performance of the perovskite solar cells. With further research, their goal is to improve the efficiency of these solar cells well above 10 percent, which is a key threshold to making these solar cells commercially competitive. Originally published by Stephanie Healey at news.nd.edu on January 24, 2014.